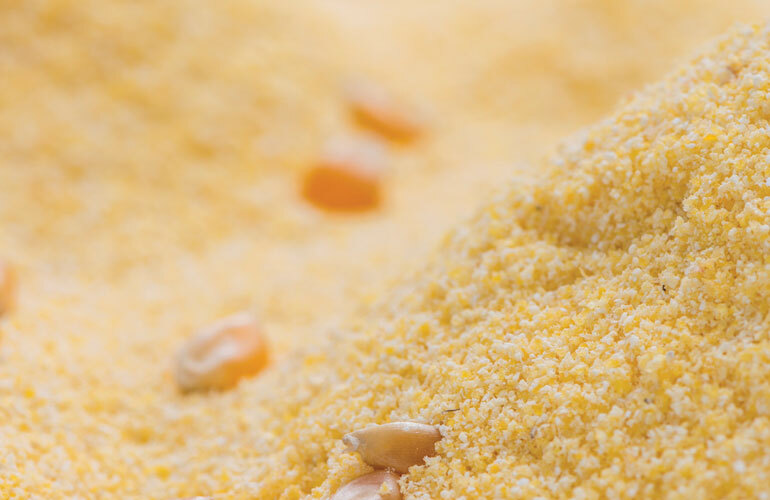 Corn gluten feed is a co-product of the wet milling process for corn. Corn grain is soaked in a weak solution of sulfurous acid for a couple of days, with the steep liquor containing amino acids, minerals, vitamins and simple sugars. The grain is then ground to separate the fiber (bran) portion from the starch portion of the grain, and the bran is filtered from the starch and oil portions. The bran is then mixed with the steep liquor in a 2:1 mixture and flash dried to produce dry corn gluten feed (DGF). The wet product is also a valuable feed source, but the cost for transportation of the water and storage issues will offset the drying costs for most beef producers. 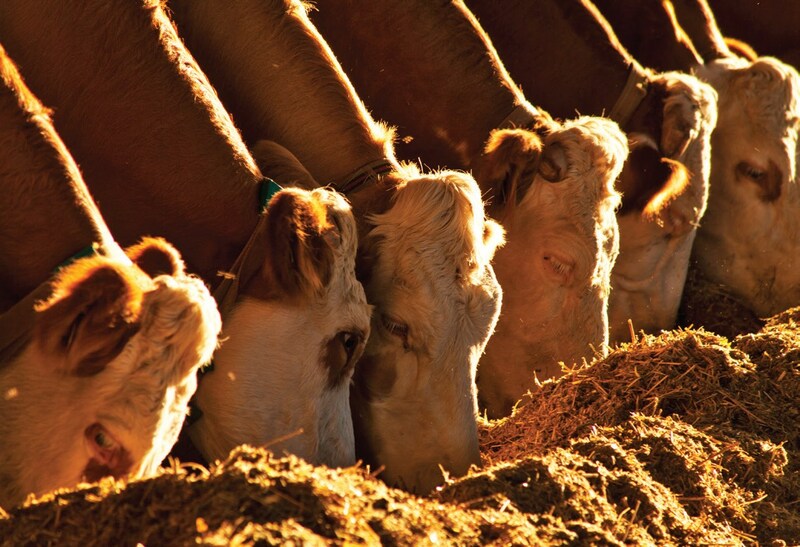 As with most milling co-products there’s considerable variation in the feed value for cattle due to differences in milling facilities and protocol efficiency. 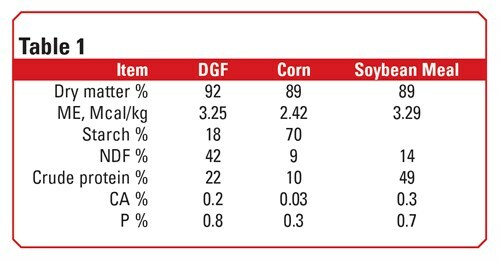 Table 1 shows a comparison of “typical” DGF with corn and soybean meal. The concentration of protein and phosphorus (P) in DGF provides both advantages and disadvantages for cattle feeders. The calcium (Ca) to phosphorous ratio (Ca:P) can be 1:10, so additional amounts of Ca will need to be included in the diet to get the ratio to the appropriate 1:1.5 Ca:P ratio. Research results show that when diets have the same level of energy, DGF is approximately equal to soybean meal to supply protein requirements in the diet. Dry corn gluten feed has also been found to be superior to soybean meal as a protein supplement for young cattle grazing lower quality forages. 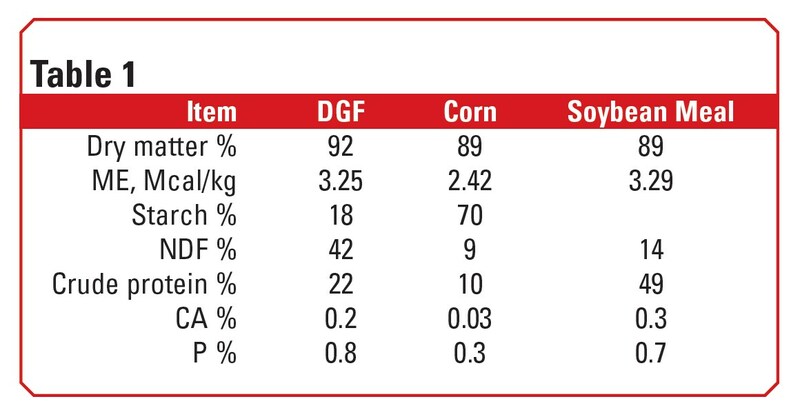 Corn has a slightly higher energy content than DGF, but differences in the ability of the cow to digest fiber renders DGF with a similar digestible energy value in a cow’s diet. Extensive trials have shown DGF in corn silage diets up to a 60 percent replacement rate of corn did not significantly change weight gain or feed efficiency. Most trials show an advantage of soybean meal/corn/corn silage diets compared to those in which corn is replaced with DGF. Replacement of corn with DGF above 40 percent of the diet tended to reduce feed efficiency consistently. 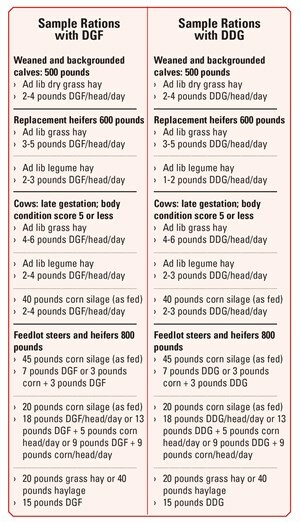 A limited number of studies have been done with grass hay as the roughage source, and no significant differences in weight gain and feed efficiency were found when DGF was fed at 40 percent of the diet compared to diets with 40 percent corn. The fermentation process that produces ethanol from corn grain results in a grain-based co-product that is low in starch, but has a concentrated, highly digestible fiber, protein and mineral content. About one-third of the dry matter of corn entering the fermentation process results in a wet distillers grain that is flash dried or centrifuged to produce dried distillers grains (DDG). Wet distillers grain (DG) is also a valuable feed source. The distinct advantage of DDG in cattle diets is the greater digestibility in diets containing lower quality forages. When corn grain is added to high forage diets at increasing levels there is lower intake and digestibility of the forage because the rumen bacteria preferentially digest the starch in the corn. With DDG there is little starch present and the forage is more highly digested. This advantage is most pronounced in weaned calves, stocker and backgrounded cattle, and in developing replacement heifers where animal performance is more efficiently enhanced with high forage diets. 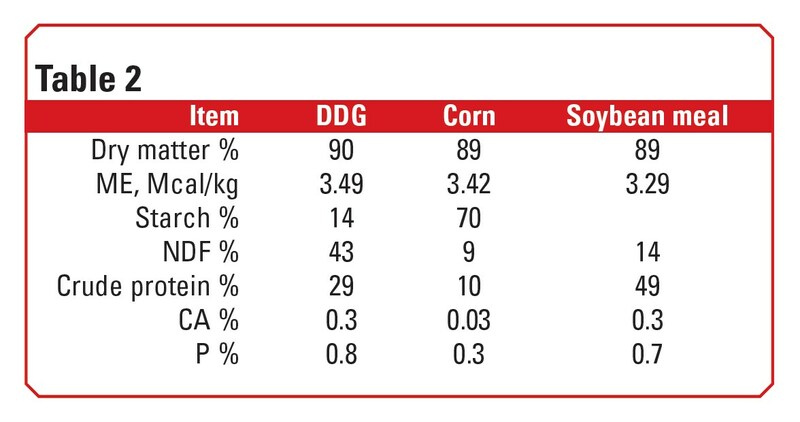 Table 2 compares the “typical” nutrient values for DDG, corn and soybean meal. The concentration of minerals in DDG includes P and sulfur (S). Although S is required by ruminal microorganisms, high levels may cause polioencephalomalacia, reduce dry matter intake (DMI) and average daily gain (ADG), and reduce liver copper stores. This feature may be enhanced by high S levels in drinking water. Declining DMI at distillers grains with solubles (DGS) inclusion levels above 30 to 40 percent may be partially explained by S, lipid, or both in the DGS (Klopfenstein, et al, 2008). The Ca:P ratio can be 1:10, so additional amounts of Ca will need to be included in the diet to get the ratio to the appropriate 1:1.5 Ca:P ratio. Glycerin is a three-carbon sugar that’s a byproduct of the biodiesel production process. It can be an effective feedstuff for cattle because they have the ability to use it as an energy source. However, very little research has been done with glycerin in cattle diets. Four studies have been completed that indicate the potential value of glycerin in cattle diets. Pyatt, et al, 2007,) showed glycerin can replace up to 20 percent of the corn in cattle finishing diets when corn was fed alone or when DDG replaced half of the corn. Glycerin supplementation increased daily weight gain and significantly increased feed efficiency in corn and corn+DDG diets (21.9 and 16.4 percent, respectively). A second study from Wyoming used glycerin to replace corn in a corn/soybean meal supplement at the rate of 15 percent glycerin for growing heifers on a grass hay-based diet. ADG was slightly lower for the glycerin supplement (2.76 pounds per day for corn/ soy and 2.57 pounds per day for glycerin/corn/soy). Kenneth Coffey, professor at the University of Arkansas, fed either corn or crude glycerin at 0.25 percent of body weight to steers grazing wheat pastures. Again, weight gain was slightly less (3.7 pounds per day for corn and 3.4 pounds per day for glycerin). Another Wyoming study showed that the digestibility of a grass hay-based diet decreased as glycerin was added from zero to 30 percent of the diet, while a similar study showed there was little difference in digestibility when glycerin was added from zero to 15 percent of the diet. It appears glycerin can be used as an effective replacement for corn in corn-based diets for both finishing and growing cattle. However, there may be a limit to the amount in the diet that will be effective, and further intake may be detrimental. Significant further research is needed before rations can be recommended that will make the optimum use of glycerin. Editor’s Note: This article was used with special permission from the Penn State Beef Extension Livestock Team. The original piece is located on the PSU Extension website at http://extension.psu.edu/animals/beef/production/articles/corn-gluten-feed-for-beef-cattle.